We may have a visitor in class this week … Eric Kunz, developer of LiveBlend. Slides for today are here. 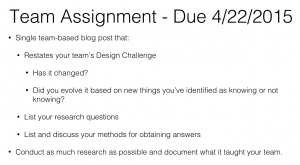 Let’s start by writing your Design Challenges back on the board. Using your sticky notes expand a bit on the things you know and don’t know and update your team’s post from last week. I will ask you to work through your research questions and methods to be ready to come to class next week to start thinking about creating your app experience.